Sahale Peak has all the makings of a classic North Cascades objective at a moderate technical standard. And…. the peak is located in the spectacular Boston Basin, one of the most iconic alpine areas in the Lower 48! The climb starts with a fairly rigorous climber’s trail on day 1 to gain Boston Basin. Starting at about 3200′, this “trail” goes up some very steep wooded terrain, over logs and crosses some rushing creeks and finally opens up into some spectacular alpine terrain at about 5200′. There are few campsites to choose from, but our personal favorite is up at 6200′ below Forbidden Peak. On day 2, we’ll rise before dawn, scramble up the moraine, and attain the Quien Sabe Glacier at about 7200′. From there,we’ll climb the glacier, zig-zagging through crevasses, until we attain the Boston- Sahale Col. From this saddle, the views across into the heart of the North Cascades are amazing. Climbing the ridge to the summit is exciting and exposed with scrambling and some 4th class rock moves at the tippy top. For strong climbers, its possible to climb Sharkfin Tower, a nearby rock tower on the way down from Sahale. On day 3, the group can elect to do another climb in the basin, cover some skills, or hike back out. Sahale is an excellent glacier route with an alpine rock summit pinnacle. 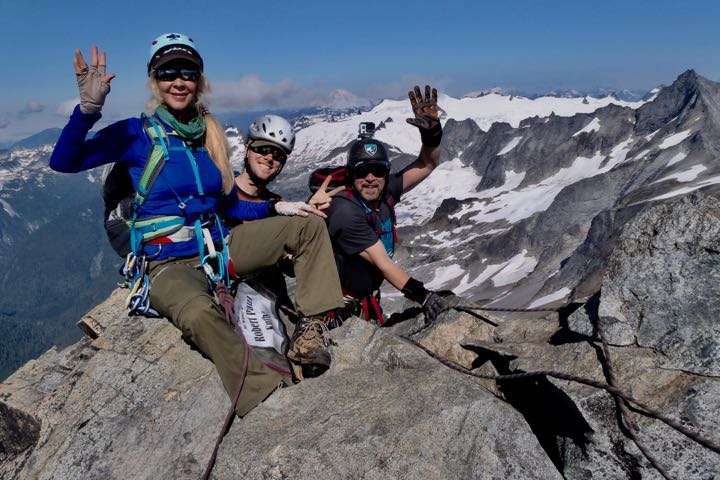 It’s a perfect introduction to the North Cascades, where glaciers yeild to alpine rock and mixed alpine terrain why you come here to climb. No experience is necessary to join this program – we’ll teach you everything you need to know!